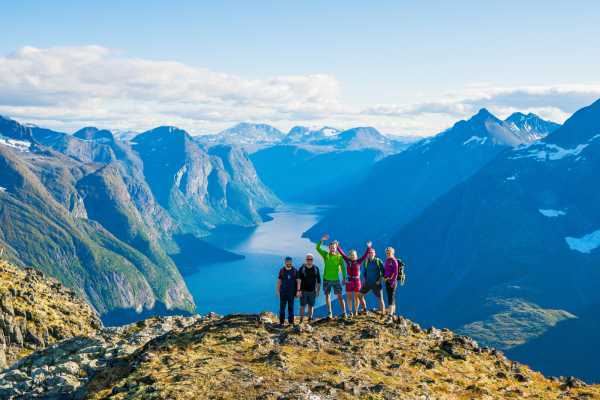 It is one of the most popular hiking trips in Norway. You have many paths to hike on and you can experience astonishing views from every accessible mountain tip. You can either start from Åndalsnes or Venjedalen (10 minutes’ drive from Isfjorden). There is a toll road to Venjedalen (50 NOK) from where you have more hiking possibilities. You have many tops to pick from, like Høgnosa, Mjølvafjellet, or Blånebba. All of these peaks are well above 1000 meters and provide amazing views over Åndalsnes and the Romsdalen Alps. There is a well-marked path all the way from Venjedalen to Åndalsnes. It is around 12 km long and you can select different mountain tops along the way. If you hike all the way to Åndalsnes you can enjoy the view from the popular Rampestreken viewpoint. You need good physical shape to hike both ways as it approximately 25 kilometers and includes several ascends and descends.